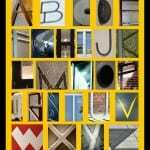 This post was originally published on June 12, 2009. It was substantially revised and re-posted on January 19, 2015. All about the wild blue yonder? 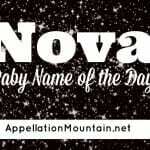 This name could be for you. 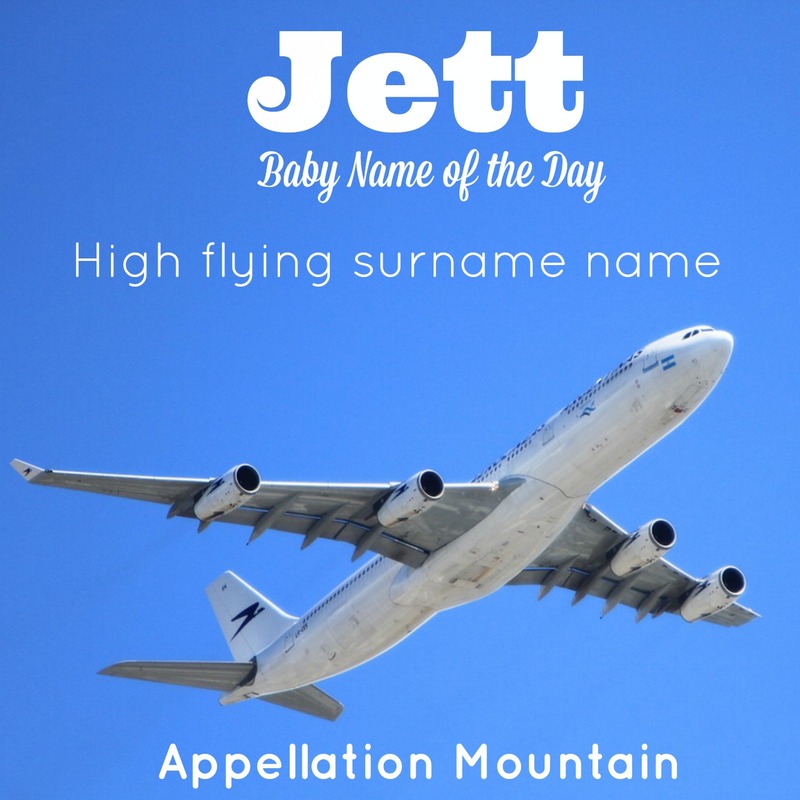 Thanks to Photoquilty and Jill for suggesting Jett as our Baby Name of the Day. This sounds like a twenty-first century name, and indeed, Jett first cracked the US Top 1000 back in 1999. 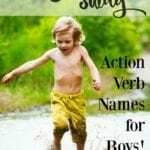 But you’ll find a steady trickle of boys given the name starting in the 1940s. That’s probably because Jett has history as a surname – though the story isn’t a happy one. In French, abandoned children were traditionally given the surname Jetté, from the verb jeter – to throw. Jett Thomas, of Georgia, fought in the War of 1812 and later served in Georgia House of Representatives. Thomas was born in 1776, so there’s plenty of pre-1999 history for this name. James Dean’ s character in 1956’s Giant. Dean scored a posthumous Oscar nomination for his role as oil tycoon Jett Rink. Since 1957, the Sharks and the Jets have faced off in West Side Story. Back in 1963, the New York Titans became the New York Jets. Martial artist Jet Li has been acting since the 1980s, in films like Once Upon A Time in China and Romeo Must Die. Joan Marie Larkin changed her name to Joan Jett and scored a series of hits in the 1980s. Late 1990s manga series Cowboy Bebop gave us Jet Black. At about the same time, the Disney Channel debuted The Famous Jett Jackson. The jet engine was developed in the 1920s, entered in military use during World War II, and by the 1950s, carried passengers. It was the Jet Age, complete with a Jet Set. Hank Williams Sr. has a daughter known as Jett. She was born Antha Belle, but took her mother’s surname as her name. George Lucas has a son called Jett. When he appeared in the Star Wars movies, young Lucas played a character called Zett. Stephen Barker Liles of country music’s Love and Theft is dad to son Jett. Meanwhile, journalist Lisa Ling gave the name to a daughter in 2013. I’ve also heard Jett suggested as nickname for Juliette, and Jet is traditionally associated with Dutch feminine names ending in -ette, too. Drop one ‘t’ and Jet becomes a gemstone, formed when wood decays under pressure. It’s dark in color – jet black. Queen Victoria favored jet while in mourning, and strands of beads made from the material were all the rage during the Roaring Twenties. Heading into 2013, Jett climbed to #324. For a name that was nearly unknown fifteen years ago, that’s quite the rise. Jett just plain hits all the marks – a single-syllable name that feels distinctly different than Aiden and Noah. It’s a modern choice, but one with enough history to feel grounded – while remaining in the bright blue sky of possibility. What do you think of Jett? Is this a great modern pick for a son – or maybe a little over-the-top? The surname Jett is derived from the Bible. According to various genealogical sites, Jett is a French derivative of Judah, the first name of Jacob’s eldest son, which means “praised” in Hebrew. Hmmm … that sounds appealing, but I wonder if it is too much of a stretch? I’ve seen Judde associated with Judah/Jude – and also Jordan. But from Judde to Jett? Maybe … but definitely not my first thought. My cousin has a young teen named Jett. I’m not sure why they chose Jett, but cousin and his wife were both Firstname Lastinital throughout grade school, so they’ve tried to avoid that for their kids. Amusingly, their name choice really confused our Dutch grandmother who sent them a pink afghan for his christening. At the time for Jett’s birth, I really didn’t care for his name and it’s still not my style… but it doesn’t seem so outlandish anymore. Shrug. That’s a great story about the Dutch grandmother and the pink afghan! My husband and I tell everyone we’re naming our son Vercingetorix, after the famous Gallic warrior, nn Jet. I actually really love Jet as a nickname for Jethro. Since hearing it on John Travolta’s son, I thought it was too “out there,” especially since I understood it was from Travolta’s love of aviation. Now after your post and reconsideration, I’m kinda digging it, for other peoples’ boys, anyway. Jetta would actually be a name worthy of serious consideration, and a great alternative to Jenna, were it not for the car of the same name. I guess if I really loved it I wouldn’t let that stop me (or so says the mother of two children who share monikers with stores at the mall). Allison, I love the idea of Jetta. Does VW still make the car? My sister had one in the 90s. What are their names? Claire and Aeropostale? Gap and Banana? Macy and Dillard? What are they? Anyway, Jett sits at #82 down here, so he’s almost common, especially in the under-5s category! Despite his interesting history – I’d assumed he was a modern moniker – I don’t like Jett. To my ear, he seems harsh and a bit too nouny – almost like a more usable name similar to Rebel or Bandit! He’s just not for me, I suppose. Though, the James Dean reference definitely doen’t hurt! That was fascinating, especially the part about the abandoned babies. I’ve always liked Jett on a boy as a GP. Jetta on a girl is equally as appealing. Interesting history! Thanks for digging that up. Obviously, it doesn’t go with Ethan, so I could never use it, but it has always intriqued me. It’s short and snappy, much like Brett, yet it isn’t nearly as preppy sounding, somehow. […] BabyCenter is growing, and it is pretty addictive. […] Jett – A modern all-boy choice with a nod to aviation and another to jet black coal, the name was most famously worn by a Disney Channel character, and by the late son of John Travolta and Kelly Preston.